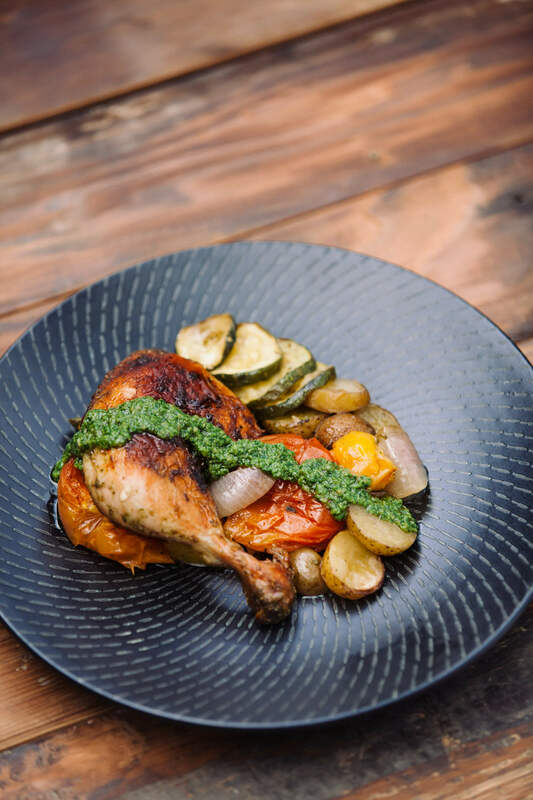 Roast chicken is always a crowd pleaser, and in a generous bed of roasted vegetables, you have yourself a comfort meal of elegance and nutrition. Marinate chicken with 2 tsp salt, a pinch of black pepper and green pesto for minimum 1 hour, or overnight. Spread the potatoes, zucchini, onion, pepper and tomatoes in a shallow roasting tin. Season with 2 tsp salt, pinch of black pepper and 2 tbsp olive oil. Lay the marinated chicken on top of the vegetables. Cover the tin with foil and cook for 30 min. Remove the foil from the tin. Return to the oven and cook for a further 30-40 min until the vegetables are juicy and the chicken is crispy. Serve with more pesto if desired.